The insect family Cimicidae contains species commonly called bed bugs, bat bugs, and swallow bugs. The 91 species in this family are wingless, obligate hematophagous ectoparasites that might feed on bats, birds, and mammals (Usinger 1966; Ryckman et al. 1981; Krinsky 2002). Generally, only two species feed on humans, Cimex lectularius and C. hempterus, but others may rarely do so as well. Cimex lectularius is the most common human-associated bed bug while Cimex hemipterus is found mostly in the tropics. International travel, immigration, changes in pest control practices, and insecticide resistance have contributed to a recent resurgence of this blood-sucking insect in developed countries (Potter 2006; Romero et al. 2007). Bed bug infestations have been increasingly reported in homes, apartments, hotel rooms, hospitals, and dormitories in the United States since 1980. A variety of clinical reactions to bed bugs have been reported and have been attributed to host responses to bed bug saliva, body proteins, or feces (Figure 1). One investigator reported that approximately 70% of individuals who were bitten had no reaction (Ryckman 1980). An important question concerning bed bug bite reactions is whether or not sensitization occurs upon multiple (sequential) biting, leading to bite reactions or more severe reactions. Perhaps persons with no reaction to bed bug bites have not been bitten before, and thus are not sensitized. 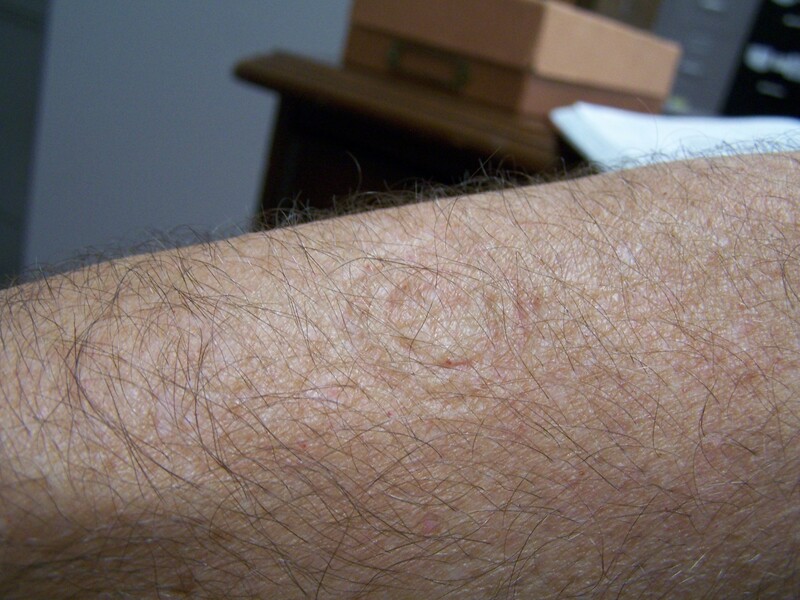 Two studies indicated that persons upon first exposure to bites suffered pruritic macules and/or papulonodules, and subsequently developed more serious bullous reactions when bitten again weeks or months later (Liebold et al. 2003; Leverkus et al. 2006). Two other studies suggested that reactions to bed bug bites may be delayed, sometimes as much as 60 hours post-bite (Hamburger and Dietrich 1937; Sansom et al. 1992). The purpose of this study was to see if cutaneous reactions to bed bug bites developed in a human subject upon multiple feedings over a period of six months. Figure 1. Bed bug bites at 24 hours with a photo of a bed bug (insert) (From Stucki and Ludwig, 2008. Used with permission). Fifteen bed bugs were obtained from a colony (Dr. Harold Harlan, Crownsville, MD) and placed in 4-dram vials with a screen covering a circular opening in its cap. The screen mesh was monofilament plankton netting, 60 x 60 filament count per inch (BioQuip Products, Rancho Dominguez, CA), which was large enough to allow bed bugs to feed, but small enough to prevent their escape. 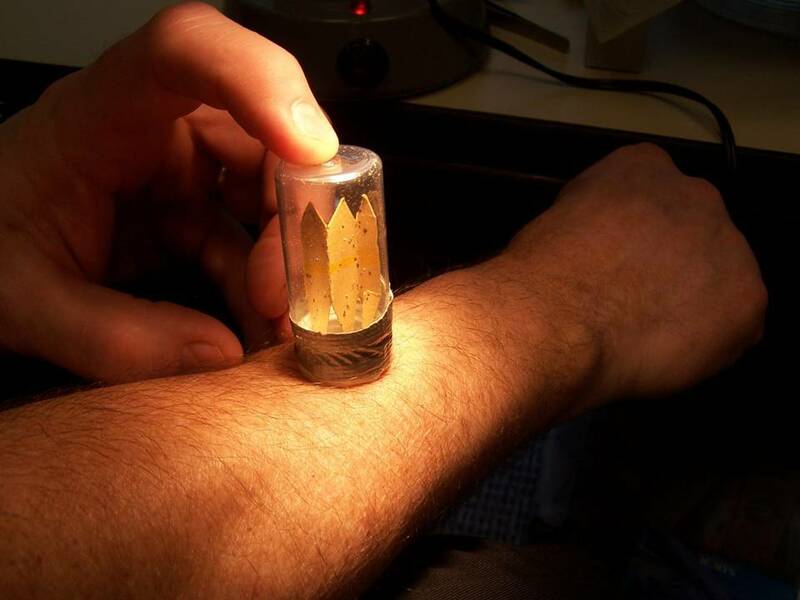 From March 19, 2008 through September 19, 2008, the entire vial of bed bugs was fed on the skin of the first author every 3 weeks by inverting the vial on the forearm for 5 minutes (Figures 2 and 3). After feeding, insects were examined with a microscope to confirm feeding by the presence of an extended abdomen with a red appearance. The feeding site was carefully examined for 24 hours after each feeding for evidence of a cutaneous response at the site of the bite or elsewhere. Figure 2. Bed bugs inside vial placed on forearm for feeding, all up on cardboard when vial first inverted. Figure 3. Bed bugs feeding. Notice no bed bugs on cardboard (all feeding). Almost all bed bugs fed to repletion every time, with only 1-2 not feeding for unknown reasons. Bugs were fed in the same spot 9 times over a 6-month period without any development of clinical reactions to their bites (Figure 4). A pin-prick sensation was noted upon biting, and puncta could be seen at the bite site for 5-10 minutes. Other than these direct (mechanical) effects, no other signs or symptoms occurred. This lack of sensitization is remarkable given the facts that the study subject is atopic (allergic rhinitis) and that there are numerous reports in the scientific literature of bed bug bites causing skin lesions in humans, presumably a result of host immune responses to bed bug salivary proteins. These data indicate that, at least in some individuals, there is no reaction to bed bug bites. Figure 4. Bed bug feeding site on arm after feeding (rings are from cap of vial). Hamburger, F., and A. Dietrich. 1937. Lichen urticatus exogenes. Acta Paediat. 22: 420. Krinsky, W. L. 2002. True bugs. In: Mullen G, Durden L, eds. Medical and Veterinary Entomology. New York: Academic Press; 2002: 67-86. Leverkus, M., R. C. Jochim, S. Schad, E-B. Brockr, J.F. Andersen, J.G. Valenzuela, and A. Trautmann. 2006. Bullous allergic hypersensitivity to bed bug bites mediated by IgE against salivary nitrophorin. J. Invest. Dermatol. 126: 91-96. Liebold, K., S. Schliemann-Willers, and U. Wollina. 2003. Disseminated bullous eruption with systemic reaction caused by Cimex lectularius. J. Eur. Acad. Dermatol. Venereol.17: 461-463. Potter, M. F. 2006. The perfect storm: an extension view on bed bugs. Am. Entomol. 52: 102-104. Romero, A., M. F. Potter, D. A. Potter, and K. F. Haynes. 2007. Insecticide resistance in the bed bug: a factor in the pest's sudden resurgence? J. Med. Entomol. 44: 175-178. Ryckman, R. E. 1985. Dermatological reactions to the bites of four species of triatominae (hemiptera: reduviidae) and Cimex lectularius L. (hemiptera: cimicidae). Bull. Soc. Vector. Ecol. 10: 122-125. Ryckman, R. E., D. G. Bently, and E. F. Archbold. 1981. The Cimicidae of the Americas and Oceanic Islands, a checklist and bibliography. Bull. Soc. Vector. Ecol. 6: 93-142. Sansom, J. E., N. J. Reynolds, and R. D. G. Peachy. 1992. Delayed reaction to bed bug bites. Arch. Dermatol. 128: 272-273. Stucki, A., and R. Ludwig. 2008. Bed bug bites NEJM 359: 10. Usinger, R. L. 1966. Monograph of Cimicidae. College Park, MD: Thomas Say Foundation.